SourceNet, a division within BNY Mellon Treasury Services, was the overwhelming choice of the CFOs, finance directors and treasurers Global Finance surveyed as part of this year’s awards. As companies look to streamline their A/P, SourceNet helps themautomate what historically has been a manual, paper-based, labor-intensive process. SunGard AvantGard Receivables GETPAID is one of the most complete collections systems around. Companies using it report substantial reductions in metrics such as DSO and bad debts. One notable addition is statistical modeling, which helps companies perform risk-based scoring and analysis of debtors to predict payment behavior. A key differentiator in the e-invoicing space is Basware’s Open Network, a B2B platform that “seamlessly” connects with other e-invoicing platforms. As analyst firm PayStream Advisors points out, Open Network means firms have to join only one network to “transact everywhere.” Basware can handle electronic and paper invoices, and offers onsite and outsourced invoice scanning. ADP provides a wide range of payroll solutions, including fully outsourced payroll as part of its managed service, International Payroll, which handles the complexities of payroll operations across multiple countries, as well as an option that enables companies to outsource those components of payroll that are labor intensive. According to PayStream Advisors, Visa has the largest percentage (42%) of global commercial and small-business card volume. Its IntelliLink Spend Management solution improves visibility and control over corporate card spend. “Unique to [IntelliLink] is the management of corporate cards at the point of sale,” says PayStream Advisors. 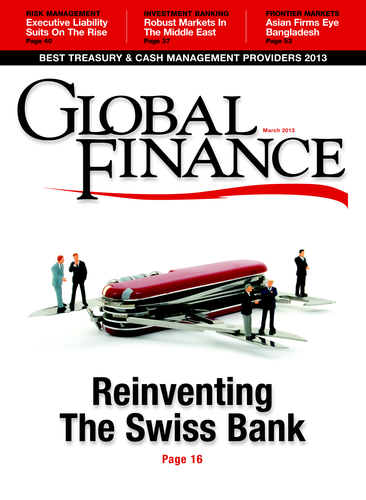 Clear2Pay received the most votes in Global Finance’s Treasury and Cash Management survey. Using its Open Payment Framework, Clear2Pay has a range of payment solutions — including its Bank Payment Hub to enable banks to move away from a silo-based architecture for processing payments. According to analyst firm Forrester, IBM is well placed to support business continuity management of large, complex organizations. It pinpoints IBM’s approach to analysis, including its Resilience Framework, which looks at different layers within a business to glean information that is used to design a strategy and architecture that is ultimately more secure and resilient. Another resounding winner from our reader’s poll, Mercer helps companies manage a wide range of pension schemes. Its services encompass administration, accounting and payments. Mercer launched its Workplace Savings solution to provide companies with more flexibility to respond to the ever-changing needs of the pensions market. Steve Evans, COO, AvantGard Treasury, SunGard, says treasurers must ensure sound access to cash and credit facilities “while dealing with resource and cost restraints as well as complying with the rules of all the regulatory jurisdictions in which they do business.” AvantGard offers a complete treasury solution for cash and risk management, managed bank connectivity and multiple deployment options. SunGard AvantGard’s hosting and managed services make life easier for companies that do not want to sustain the manpower or level of investment required for an inhouse system. “Corporations today are challenged with reducing IT costs and increasing business demands,” says Steve Evans, COO, AvantGard Treasury, SunGard. SAP provides a range of enterprise software solutions based on firm size. Analysts rate SAP highly for its cash management functionality and strong product development, and despite increasing competition from the likes of Oracle, SAP still boasts the largest market share. Service bureaus are an increasingly popular means for corporates to connect to the bank-owned network SWIFT. Following its merger with BankServ, Fundtech now offers an enhanced SWIFT service bureau to access a wide range of SWIFT utilities. Jean-Luc Robert, chairman and CEO of Kyriba, says the ability to reliably forecast revenues and payments is vital when making critical borrowing and investment decisions. With Kyriba, subsidiaries can input forecasts, and the data is then merged with real-time bank reporting to produce a consolidated global forecast. Reval offers an all-in-one solution that integrates cash and risk management functionality to address a broad range of risks, including liquidity risk, sovereign risk, currency risk and commodity, operational and compliance risk. It also provides access to a wide range of data, including rates and banking information, as part of its SaaS offering. Ernst & Young came out on top of a large field of treasury advisers, according to the more than 300 treasurers, CFOs and financial professionals Global Finance surveyed in its reader’s poll. Ernst & Young produces regular reports on cash and treasury management systems and providers, and advises on a range of key areas that impact treasury and cash, including corporate funding, liquidity management and risk management. SAP’s Financial Services Network, which was announced at Sibos in Osaka in 2012 and is supported by a number of leading cash management banks, is a Cloud-based service designed to facilitate multibank routing, multiformat payments, on-boarding and corporate services application development and deployment. Wells Fargo, a pioneer in corporate mobile banking, continues to dominate thanks to enhancements to its CEO Mobile service. Recent additions include CEO Mobile Deposit to capture check and money order images and deposit funds using an iPhone. “As our customers move from paper to electronic systems ... they are increasingly adopting our online and mobile channels,” says Secil Watson, head of wholesale Internet solutions, Wells Fargo.